But it isn't easy to pass for human. Especially not around Zeke, who might see past the monster inside her. And Allie soon must decide what—and who—is worth dying for." I thought I had lost interest in vampire books. The Immortal Rules has renewed my love for them again. 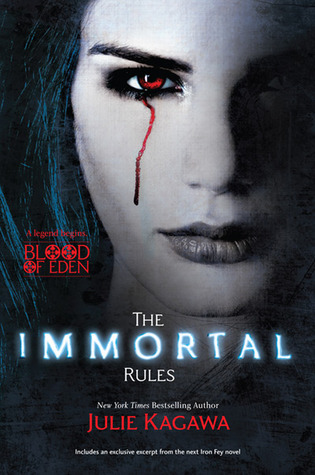 In The Immortal Rules, Julie Kagawa has created a world in which vampires rule, humans are food cattle and rabids roam the lands. It might interest you, excite you, scare you or haunt you but it will most certainly leave its mark on you and you won't ever be able to forget this story. In a good way of course! We are introduced to Allie, a girl who was born into a vampire city. After losing her mother, she has to learn to fend for herself with the other Unregistered's - human's who refuse to be branded as blood bags for the vampires. After finding a basement of food, this leads to a series of events which land her choosing immortality over death. Disgusted by herself, her choice and her fellow vampires she has no choice but to learn to live as one of them or die on her own. This leads to another series of events which take her out of the city and fending for herself. She catches up to a group of humans and pretends to be human all the while fighting The Hunger. What results is an amazing tale of what it really means to be a human and have humanity. This book keeps you on the edge of your seat and holding your breath in the best possible way. I absolutely loved and I can't wait to see what happens next! The Immortal Rules is released on April 24th - less than two weeks away! I suggest you pre-order it right now as I doubt it will stay on shelves long! I'm so excited for this book - the more reviews I read the more I want to read it - so glad there's not long left!